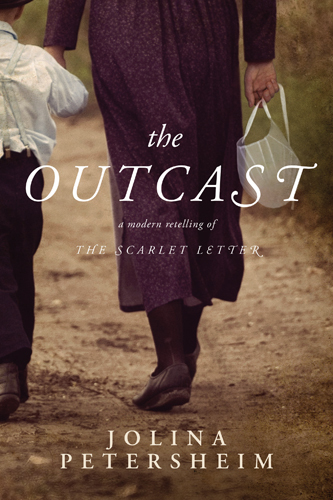 The Outcast is not due out until July but it arrived on my doorstep just yesterday for review. Why am I mentioning it? Because it's advertised as being a "modern retelling of The Scarlet Letter." Given the fact that we just finished reading this collectively for the Reading to Know Book Club (February) - which sparked some interesting discussion about the Puritans - I had to mention this new title! It is Christian fiction and I'm always suspicious but you know I've gotta give this one a read. And I'll read it soon while The Scarlet Letter is fresh on my mind! "Raised in an Old Order Mennonite community, Rachel Stoltzfus is a strong-willed single woman, content living apart from mainstream society until whispers stir the moment her belly swells with new life. Refusing to repent and name the partner in her sin, Rachel feels the wrath of the religious sect as she is shunned by those she loves most. She is eventually coerced into leaving by her brother-in-law, the bishop. But secrets run deep in this cloistered community, and the bishop is hiding some of his own, threatening his conscience and his very soul. When the life of Rachel's baby is at stake, however, choices must be made that will bring the darkness to light, forever changing the lives of those who call Copper Creek home." This is her debut novel. She holds degrees in English and communication arts from the University of the Cumberlands. She and her husband are said to "share the same unique Amish and Mennonite heritage that originated in Lancaster County, Pennsylvania, but now live in the mountains of Tennessee with their young daughter." Hmmmm. . .curious indeed! At first I was annoyed at "a modern retelling" because that never sounds good, but the synopsis actually sounds rather interesting. Then again, I am so over the bizarre "christian fiction" obsession with all things Amish and Mennonite. Like Shonya, I'm a little tired of the plethora of "Amish fiction," but this sounds interesting. And the author lives in TN -- that caught my eye, too, since I'm there now! I may give this one a try myself. Carrie, I am delighted that you are featuring The Outcast on your site and also plan to review it personally. Speaking on behalf of the publisher, Tyndale House has never before published a work in the "Amish fiction" genre, but this story is based on an actual incident and so powerfully told we simply could not pass it up. Huh. It does sound compelling, esp for Amish fiction. Looking forward to your thoughts! I'm definitely intrigued. I'm a sucker for a modern retelling even though, as Shonya says, it's rarely good. Actually I just finished "Hester: The Missing Years of the Scarlet Letter" by Paula Reed actually. I found it accidentally while trying to put The Scarlet Letter on hold at the library. I wouldn't recommend it, but it was an interesting take. Thank you so much for sharing about The Outcast! Though I have a Plain heritage, I never thought I would write Amish fiction until I was told a story whose premise I knew others needed to hear as well. Hope you enoy!